It is with great sadness and heavy hearts that we mourn the passing of one of our own. 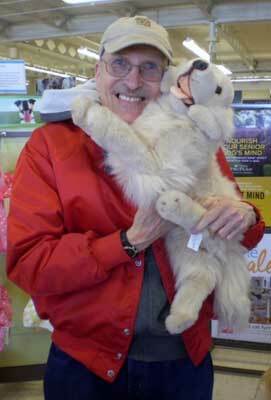 Howard Schultheis was a longtime board member and dedicated volunteer for Long Island Golden Retriever Rescue. Very seldom would he turn down an opportunity to help one of "his" beloved Goldens. Howard did home visits, dog evaluations, transports and adoptions, most often accompanied by his devoted wife, Ronnie. Howard and Ronnie were also actively involved in fundraising for LIGRR for many years. Howard wrote 2 books about LIGRR Goldens, "Golden Eclipse, Heart Dog" and "Saving Cinco", and donated the profits back to Long Island Golden Retriever Rescue. Beyond rescue, Howard was also a wonderful human being, with a generous, compassionate heart. He did pet therapy with Eclipse and also did hospice work, staying with people who were dying, when no one else was able to do so. Howard was an innovative elementary school teacher and a funny, funny man. He was also a great friend. Howard had 3 great loves — his wife, Ronnie, his Goldens and … Mickey Mouse. We hope he and Walt Disney are giving Eclipse treats on the other side of the Rainbow Bridge. The world is a sadder place without Howard in it. We will miss him very much.